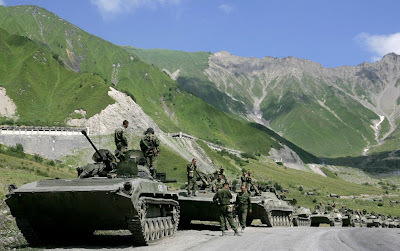 A convoy of Russian troops makes its way through the Caucasus Mountains toward the armed conflict between Georgian troops and separatist South Ossetian troops, in the South Ossetian village of Dzhaba on August 9, 2008. Georgian President Mikheil Saakashvili declared a "state of war" as his troops battled it out with Russian forces over the breakaway province of South Ossetia. 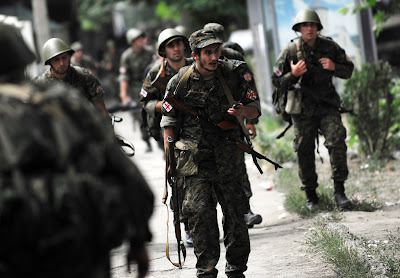 Last month, separatist authorities in the Georgian breakaway region of South Ossetia arrested four Georgian soldiers in Tskhinvali on July 8, 2008. South Ossetian authorities said they had arrested the soldiers amid heightened tensions in the mountainous province. The soldiers were later released. 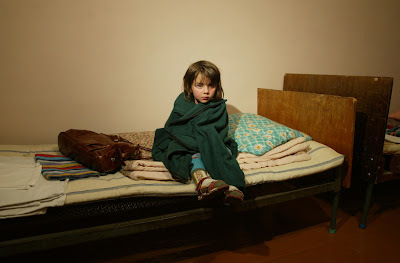 A refugee girl from the Georgian region of South Ossetia sits on a bed after her arrival to Russian territory in Vladikavkaz, the capital of Russian North Ossetia early on August 4, 2008. Refugees have been leaving South Ossetia for days now, anticipating possible heavy conflict. A convoy of Russian troops makes its way through the mountains toward the armed conflict between Georgian troops and separatist South Ossetian troops in the South Ossetian village of Dzhaba. Georgian soldiers walk in Gori, central Georgia, on August 9, 2008. Georgian President Mikheil Saakashvili declared a "state of war" on August 9 as his troops battled it out with Russian forces over the breakaway province of South Ossetia. Earlier, Russian warplanes bombed the Georgian city of Gori, killing civilians, Georgia's Public TV reported. 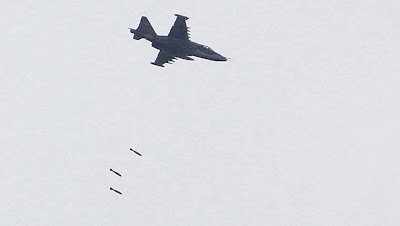 An unidentified fighter jet drops munitions near the Georgian town of Gori. 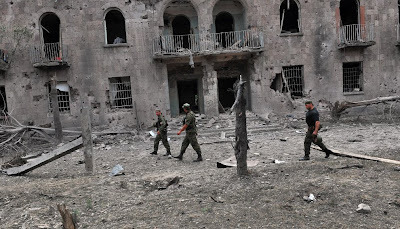 Georgian soldiers pass by a building hit by bombardments in Gori. 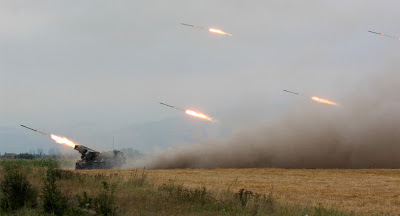 Georgian troops fire rockets at seperatist South Ossetian troops from an unnamed location not far from Tskhinvali on August 8, 2008. 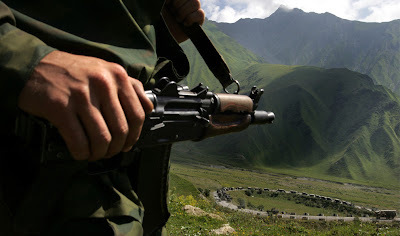 Georgia is taking measures to prevent Russian "mercenaries" from infiltrating the country, its prime minister said as Georgian forces attacked the Russian-backed breakaway province of South Ossetia. 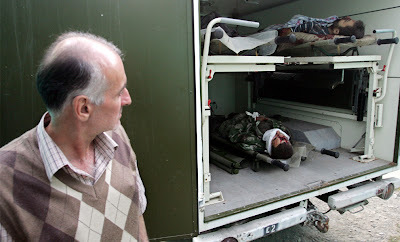 A man looks at unidentified men killed fighting for the South Ossetian side in the conflict in the town of Dzhava, South Ossetia on August 9, 2008. Russian Prime Minister Vladimir Putin said "dozens" of people had been killed in Georgian attacks on South Ossetia, contradicting a claim by Moscow's separatist allies of 1,500 dead. 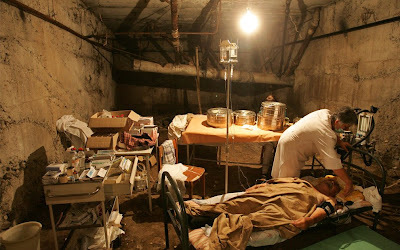 A South Ossetian doctor stands next to a wounded man in the basement of a destroyed hospital in Tskhinvali. 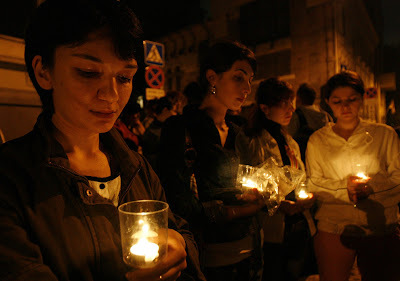 People hold candles during a protest front of the Georgian embassy in Moscow August 10, 2008. French Foreign Minister Bernard Kouchner flew to Tbilisi on Sunday on an EU mission to mediate an end to the conflict in Georgia's rebel South Ossetia region, which was under Russian control after Georgian forces retreated. 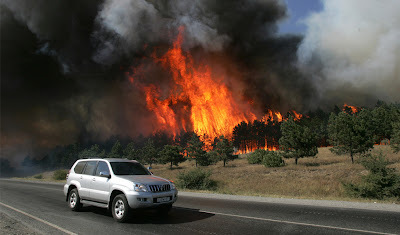 A car passes as fire engulfs the woods near the Georgian town of Gori, just outside the breakaway province of South Ossetia, Sunday, Aug. 10, 2008. Georgian troops retreated from South Ossetia on Sunday and their government pressed for a truce, overwhelmed by Russian firepower as the conflict threatened to set off a wider war. 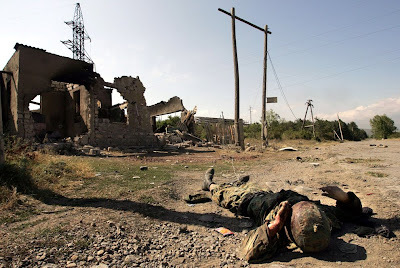 A Georgian soldier lays dead on a street, after earlier fighting on outskirts of Tskhinvali. 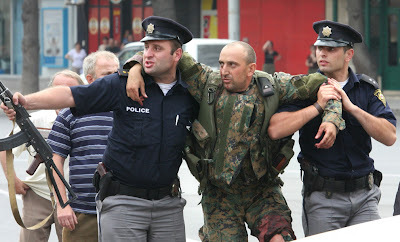 Georgian policemen evacuate a Georgian soldier wounded in battle with South Ossetian separatists, in the town of Gori on August 8, 2008. Russia's defence ministry said that more than 10 of its troops deployed as peacekeepers in South Ossetia have been killed amid a Georgian offensive in the breakaway region, Russian news agencies reported. 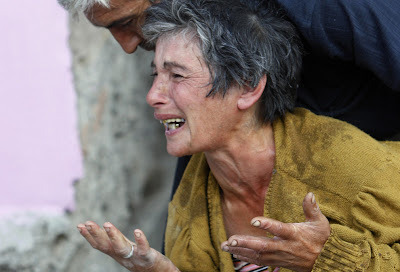 An unidentified crying Georgian woman is calmed by her husband after finding out that her child was killed in a neighboring village, in Gori, about 80 km (50 miles) from Tbilisi. On Thursday, August 7th, Georgian armed forces entered into the breakaway region of South Ossetia to assert Georgian governance of the region - a de facto (yet largely unrecognized) independent republic that has support from neighboring Russia. Russia responded on August 8th by sending its own military into Georgia - not only into region of South Ossetia - but also into the nearby breakaway republic of Abkhazia and deeper into Georgia itself. Many Airstrikes and ground skirmishes have taken place since, with several parties calling for a cease-fire, but no agreement as yet. Those paying the highest price for the war are the South Ossetian civilians, which may have suffered (depending on who is reporting) between 100 and 2,000 deaths to date.